Get a grip folks; it's not that big a deal. Venezuelan president Hugo Chavez ascends the podium at the U.N. General Assembly and says "the devil came here yesterday," referring to President George W. Bush, who spoke from the same podium just a day earlier. His remarks are greeted with applause by diplomats representing many of the world's nations. Iran's Mahmoud Ahmadinejad also used his U.N. appearance to castigate the Bush administration. And ditto for Sudan's Omar al-Bashir and Bolivia's Evo Morales. It's that time of year when world leaders gather at U.N. headquarters to create real havoc with New York City traffic as well as virtual diplomatic and political havoc with the U.N.'s host nation. Every leader gets his or her fifteen minutes in the spotlight. And most use their time for standard policy statements which concern their countries. But there are always a few leaders who simply feel, either for nationalistic or individual pride, the urge to use their time to provoke, to use the U.N. podium as their personal platform to see and be seen as an actor on the world stage. Fidel Castro has done it for decades. Muamar Qadafi and Yasir Arafat always got more headlines than most of their colleagues combined. So what's the big deal this year? What is the media getting so excited about? Why does House Democratic Leader Nancy Pelosi, D-Calif., feel compelled to call Chavez "an everyday thug"? And the Secretary of State says Chavez's comment "is not becoming a head of state." Even Bush critic Charles Rangel, D-NY, took up the cause, declaring: "I just want to make it abundantly clear to Hugo Chavez or any other president -- don't come to the United States and think because we have problems with our president that any foreigner can come to our country and not think that Americans do not feel offended when you offend our Chief of State." One diplomat in Washington, who didn't want to be identified for obvious reasons, said "it was all so much hot air." Besides, whatever happened to the phrase parents used to teach their kids about being taunted on the school playground: "sticks and stones may break my bones, but words will never hurt me." When diplomats draft a peace agreement words matter. When political leaders choose to be verbally outrageous words matter only if you choose to let them. Because of poor health, Castro did not have the pleasure of tweaking the Bush administration this year in person. 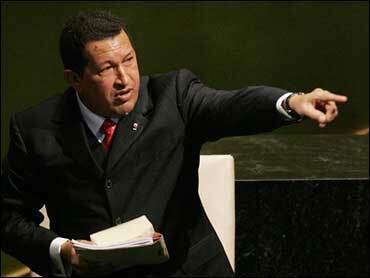 Maybe Chavez's especially strong words this year reflected his recent meeting with his good friend and ally in Havana. No one knows for sure and it doesn't really matter. Chavez has proved perfectly capable of jousting with his American adversaries on his own. How far Chavez wants to take this tack has yet to be played out. Venezuela has close economic ties with the U.S. through its oil exports and part ownership of a huge energy-based company, CITGO, in this country. Perhaps the Venezuelan leader wants out of the American market and into the potentially larger Chinese market. Or perhaps it's simply that he enjoys center stage. An unfortunate byproduct of all the attention on the rhetoric of a few world leaders has been less focus on the very real issues facing the U.N. now. Among them, whether to sanction Iran for its refusal to abide by the Security Council's demands, and whether to insist the U.N. assume control over an international peace-keeping force in Sudan's Darfur region despite Khartoum's objections. As long as Chavez and Ahmadinejad are holding news conferences, making speeches and granting an unusual number of so-called "exclusive" interviews, we will continue to see and hear their over-heated rhetoric. In the coming weeks and months, we'll find out whether these leaders were here to seek solutions or the limelight.